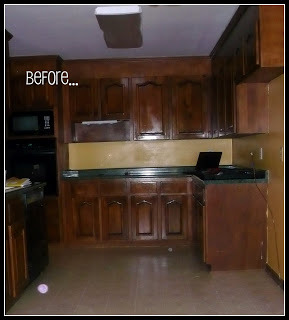 Seriously, I’m not playing around… if there is any other option that is left unexplored, then explore it before you paint your cabinets. However, if painting your cabinets is your lifelong dream, then who am I to stand in the way? Maybe my experience will help you not make the same mistakes. 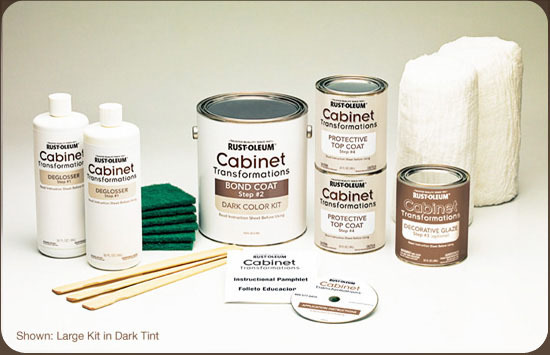 I saw a commercial and a few good reviews of Rustoleum’s Cabinet Transformations kits. It boasts no sanding, no stripping and no priming. 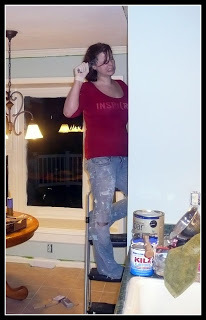 Plus, it comes will everything you need, so mid-way through my project I wouldn’t have to make another trip to Lowe’s. My lazy self thought “oh perfect! a simple solution!” HA! My mother always calls me “a marketer’s dream,” which let’s face it… I am. I’m a sucker for an infomercial. I proceed to measure my cabinets and based on the online tool, I estimated that I needed one 1 large kit and 1 small kit. In fact, that ended up being way too much. I didn’t even open the small kit and of course, they are non-refundable, so there’s $80 bucks wasted. 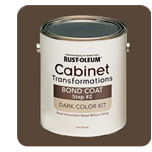 Of course, I could still use it to refinish something else in my house. I probably will at some point when I forget what a horrible experience this was. 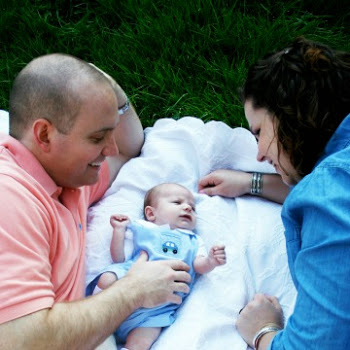 If I were to start the whole thing over, I would go with the way Stacy did it on her blog Not Just a Housewife. Unfortunately, I read her blog about 5 days after starting my process. 🙁 She spray painted the whole thing and it looks amazing. Follow her lead, not mine. This step is supposed to prepare the surface by cleaning and roughing it up a bit. Tip #2: Don’t let your gloves get holes in them. Tip #3: Don’t plan to workout on the day you do this. This will tone your arms faster than any machine could. All in all, this step took me about 4 hours over the coarse of two evenings. 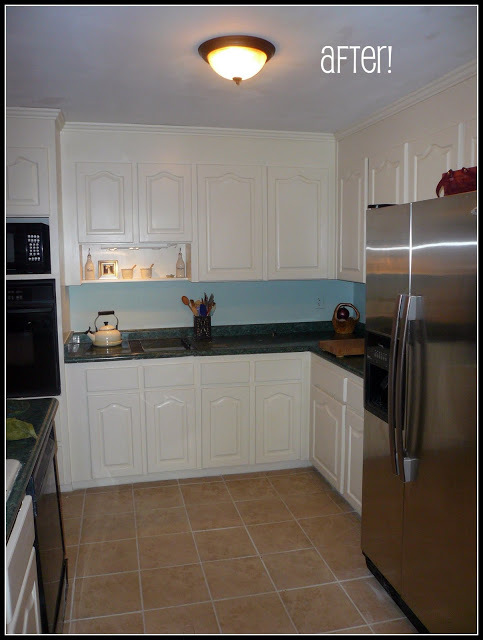 The bond coat is a creative name for the special type of paint that bonds to the surface that your painting. It is also tinted to one of the many color options from the box. I had read in my reviews that you could actually have them tint it any color, but Lowe’s wouldn’t do that for me. 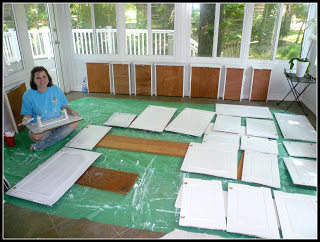 Tip #1: Paint 2 coats on the backs of cabinets and then 2 coast on the front, instead of flipping them over between each coat. This step takes a long time. They suggest 2-3 hours to dry between each coat. Since I was doing this after work, that means I could only do one coat per day. Plus, you have to do 2 coats on the fronts and 2 coast on the backs of the doors, which is technically 4 days. 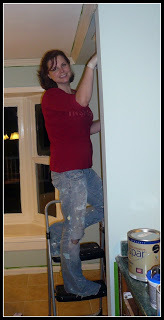 After two coats of bond coat, I did a third coat of my linen white so that it matched my trim and everything else. 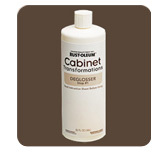 Rustoleum definitely does not recommend this and I may not have as long of lasting results because of it. I’ll let you know in a couple of years. This step took two days since I did a coat on the backs and a coat on the fronts and let them dry for 2-4 hours between. This is where I really met with issues. This stuff is like water it’s so thin. It drips everywhere. Rustoleum suggests painting the backs and then the fronts, which is what I did. If I could do it over, I would do the protective coat on the backs, then hang the doors and then do the protective coat on the fronts. This step took another 2 days. In the end, it took me 10 days of actual work, but I wasn’t able to paint for 10 days in a row, so it was really like 13 beginning to end. The kit actually did have everything I needed other than paint brushes. Not everyone has the perfect set-up for a major project like this. They want the doors laid on in a non-ventilated, sun-less, dust-free space. I don’t have any rooms that fit that description… my garage was currently storage for boxes and covered in dust from sawing, so Plan B was the unfurnished sunroom. A sunroom is (as the name implies) not sun-less, but it was the closest I had. Very few people have a space like what they are asking for. It’s probably why I have dust on my finished doors and now have to do touch-ups to cover it up. They advertise this as a weekend project, but it’s definitely not because of how many coats must go on the doors with 2 hours in between. I have this wierd habit of sleeping at nights (even on the weekends). The protective coat is very difficult to work with. It goes on cloudy but dries clear. However, if you allow a drip to dry on the surface, then the drip is slightly yellowish and not clear. This was a little bit of a bummer of a blog. So I’ll end on the oh-so-happy note that I’m going on vacation tomorrow!!! I’m so excited about the craft that I get to show you today! 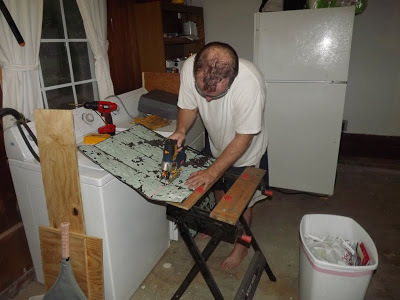 I almost wrote this blog last night but we had someone coming to look at the washer/dryer that we posted on CraigsList. He bought them! So excited to get rid of them and have an extra $200 for more decorating in the bank. 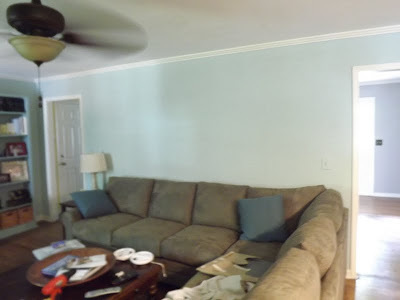 I was completely stumped by what to put on this HUGE wall behind my sectional. Everything that I looked at was dwarfed by the size of this wall. It definitely needed something. Well, remember this awesome piece of ceiling tile that I purchased at the Tobacco Barn on my shopping trip? It was regularly $120 but it was on sale for $40. It came out of an old warehouse that burned down and it was still covered in soot. I originally considered hanging it as is, but it just looked a little frumpy up there, but it was almost the right size. Plus, I still really wanted some kind of mirror to go up there to reflect back the light from the windows. So, I had my sweet husband cut them into two squares and cut the centers out. Plus, I just so happened to have some extra mirrors sitting around. They came out of the guest bathroom when the previous owners updated it. 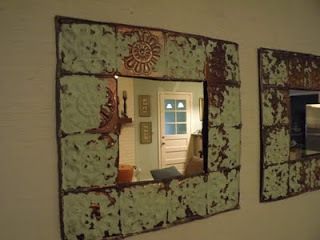 They were simple builders grade mirrors. 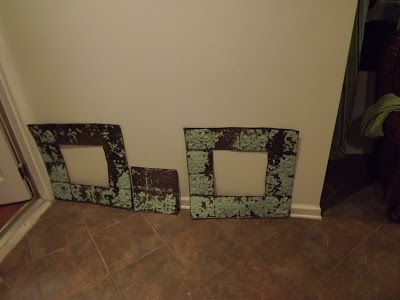 I took them to the glass cutters and for $10 had two 18×18 mirrors. Perfect! 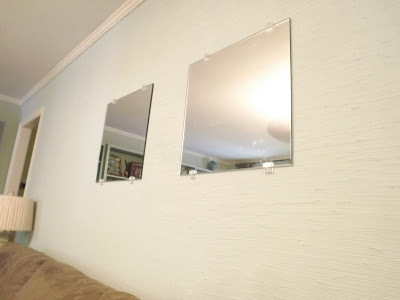 We hung them on the wall with a mirror hanging kit that we picked up from Home Depot for $5. 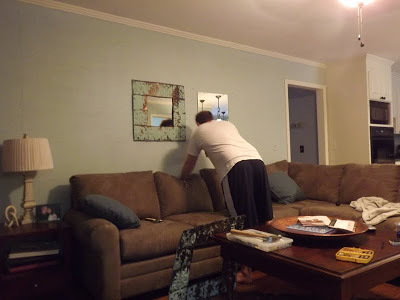 After we hung the mirrors, we hung the frames around them with simple nails. That’s it! 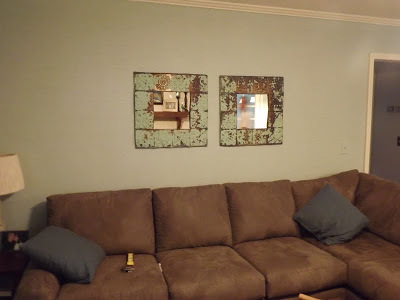 Two custom mirrors that measure 24×24 each for $55 total. I love the way the metal has different shades to it from age. 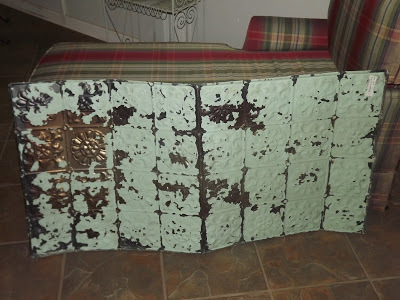 The bronze part really picks up the color from the sofa. 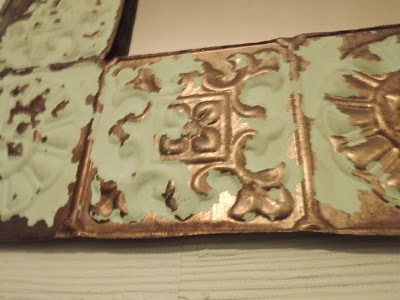 Now, I have these two extra pieces of tile that came out of the center. I thought about hanging them on either side of the mirrors, but it looked a little TOO symmetrical, ya know? I’ve also thought about hanging them somewhere else in the room as simple wall art. What do you think?